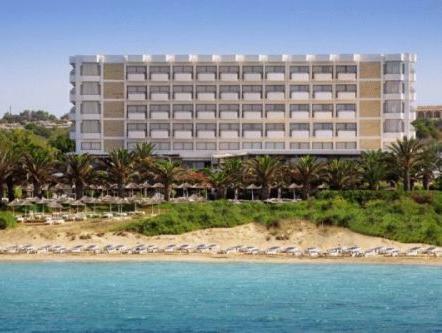 ﻿ Alion Beach Hotel Ayia Napa. JIMAT di Agoda.com! Ayia Napa Hotel yang elegan ini mempunyai sebuah taman palma yang subur dengan akses terus ke pantai berpasir di Teluk Grecian. Restoran yang elegan di sini menawarkan masakan antarabangsa dan peluang untuk menjamu selera di tepi kolam renang. Semua bilik mewah di Alion Beach Hotel mempunyai balkoni berperabot yang menawarkan pemandangan Laut Mediterranean atau taman dan hiasan kontemporari. Urutan ceylon yang eksotik dan rawatan badan coklat boleh dinikmati di spa Alion, bersama-sama dengan sebuah gim. Para tetamu boleh berehat di buaian di taman, atau di geladak berjemur di kolam renang luaran. Dapur terbuka dan malam-malam bertema ditawarkan di Restoran Symposion. Anda boleh menikmati kopi dan sebuah buku mengenai sejarah Cyprus di Lounge Perpustakaan Muses, atau hidangan makan tengah hari Cyprus tradisional di restoran kolam renang. Tempat letak kereta peribadi percuma disediakan di Alion Beach Hotel. Lapangan Terbang Larnaka terletak sejauh 30 minit pemanduan. 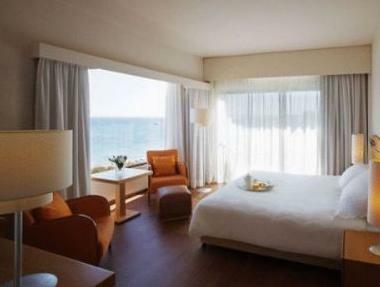 This hotel has the benefit of being right in the centre of town with direct access to the beach. I had the panoramic sea view room, which in my opinion wasn't as good as the normal sea view as the balcony was on the side of the room not directly looking out to the beach. The air conditioning was quite noisy and not very effective during the day but it was the middle of summer. The good thing was that there were allocated sunbeds, but these were not directly on the beach but only about 10m away on the grass. The deck restaurant was particularly nice for dinner make sure you make a reservation! The buffet breakfast had quite a lot of options. There was a nice walking trail along the water to take in the morning towards Cape Greco. All up a decent hotel, not 5 star but very good service. The staff are very attentive however the a la carte menu is over priced €25 for one dish when u can go out and feed two people in that price. we stayed in December an out of season time and would you believe a large group of people had a party all night long downstairs in the suite we couldnt even sleep. It was so loud i dont think cyprus has laws of sound control we were very disturbed and rang reception but they didnt do anything about it. Another I didnt like was their false advertising they had up offering blowdrys for €20 when i rang to book the woman that they call the hair stylist in and she cant come despite the fact i was staying a week? Lame if you u ask me. I had a €70 body massage and it was awful it didnt relax me the woman just had no technique in her hands. Location - Nice location as a beachfront hotel. Slightly elevated from the beach which allows for a good view of the sea. A little bit too far to walk to the town center but this could be good thing if you are the type to relax by the beach all day and want to stay at a quieter resort. Facilities - building was a little old but well maintained and clean. You can reserve your own lounge chairs for the duration of you stay. It was pretty busy so all of the best spots were taken while we were there but it was still nice to know that I didn't have to search and hope for an open lounge chair. We could have checked for openings on the lounge chairs on a daily basis but never bothered. 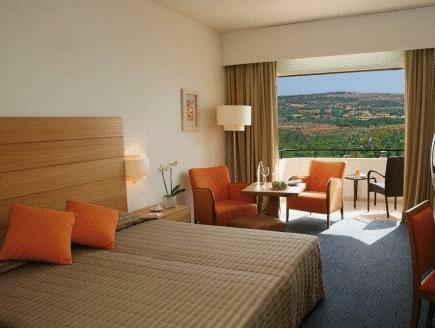 Staff - all of the staff were courteous and helpful Room - Rooms were clean and were ok in size - for europe. The only complaint were how saggy the beds were. I like my beds flat and the center of the beds were so depressed that when lying down, it felt as though my hips were 5 inches below my feet and head. It's not on the main street but it's so close to the beach/water I didn't want to go anywhere after checking in. The view was just amazing - lying in bed I saw nothing but the sea. Love the idea that a sunbed is arranged at checkin and it'll be your sunbed during your stay. Hotel couldn't arrange a late checkout for me because the room was booked, but they let me keep using the pool until I had to leave, and I did! there're also welcome fruits! helpful staff too. Our stay was pleasant. It was low season and basically most of the hotels were closed. However, we still had lots of fun in Cyprus. Hotel staff were very helpful and friendly. The room is average but we enjoyed our stay. modern stylish interiors. staff very helpful. obviously a very popular hotel with the german tourist. trevlig med bra service man kände sig välkommen. bra städat frukost och i övrigt restaurangen hade bra mat. vänlig personal. отель хороший, сервис отличный, персонал старается, выполняет любую просьбу, мы отдыхали с маленьким ребенком 2х лет, по просьбе в течение 10 минут готовили ему отдельное питание (пюре, курочку, варили сосиски), пляж для ребенка отличный, вход пологий, детей в отеле почти нет, поэтому детский бассейн был полностью в нашем распоряжении, дочь от него была в восторге. отдельное спасибо кондитеру от мужа за вкусные десерты!